Letherbee Distillers and began when Brenton Engel’s moonshine inspired the bar scene of Chicago. In concert with Brenton they teamed up to develop Letherbee’s line of products— including Letherbee Gin. Letherbee becomes cloudy when diluted below 48% ABV. This is because some of molecules (like anethole, which comes from aniseed, star anise and others) are soluble in ethanol, but are not soluble in water. They come out of solution. As any absinthe drinker will tell you, the aroma intensifies here as it is diluted. If you choose to do this with your Letherbee Gin, a beautiful aroma will emerge. The nose is intense. Letherbee Gin is camphoraceous with vegetal, juniper undertones. Knowing the botanicals they use, it’s even harder to place. Rooty, earthy anethole is front and center— but herbaceous juniper, fennel bulb with a hint of Egyptian licorice tea. Quite lovely and richly herbal. Tasting— Letherbee Gin begins with juniper and aniseed notes. Coriander and orange peels mid-palate, unfold revealing cardamom and black pepper. There’s plenty of licorice in the background giving Letherbee an unctuous depth and rich mouthfeel, similar to a botanically sweetened Old Tom. Letherbee Gin gets a cloudy haze in a gin and tonic. What flavor you get can depend on whether you slowly pour a cold tonic water into it (maybe down a straw?) or whether you go for a 5:1 heavy tonic water G&T. They’re all good, but the former has a bit more fennel and anise notes. I also found it to make a really outstanding Gin and Tonic with a tonic syrup. I used Pinckney Bend’s Classic Tonic Syrup, and there’s a really nice balance and interplay between the herbs in both. Highly recommended. 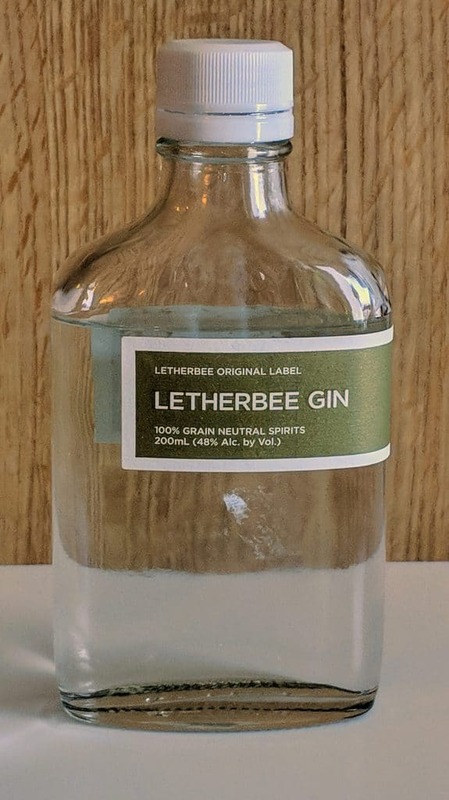 Depending on your Martini ratio— or preference for stirring or shaking— Letherbee Gin can come out as if a completely different spirit. Dry, it’s bright and slightly vegetal. Wet, and it’s rich, earthy, and spice forward with a heavy dose of fennel and anise notes. Like I said, you can’t always judge a gin by its cover. Neat, I wasn’t really crazy about Letherbee Gin. Diluted, it starts to come together. But cocktails are where it does its best work. Although I wasn’t crazy about it in the G&T, I found that it worked when you really got down to mixing. I’d love to get a bit more juniper out of it, but the loud fennel and quite juniper works better than I might have guessed.